Kids can be cruel. Mitchell was called chicken legs throughout his childhood. But kids can also be motivators. 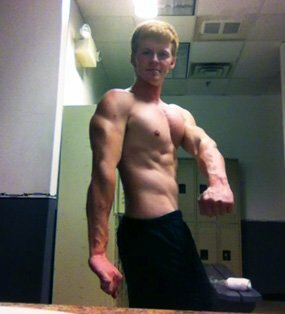 The negative comment pushed him to gain 25 pounds of muscle in six months! First, let me start by telling you how I got in the gym. 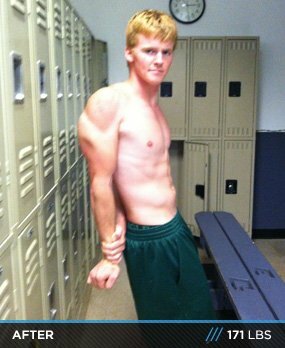 During my freshman year of high school I met my new youth leader, natural bodybuilder Mike Madger. He introduced me to weightlifting, and after a two week trial with him I was hooked. I was always skinny and my famous nickname was "chicken legs." Honestly, it sucked! I didn't want to be known for how lanky I was. 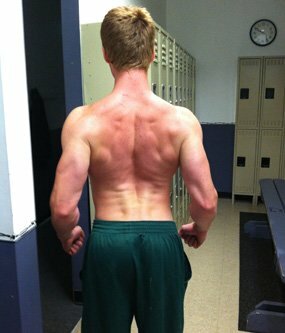 For the first six months of lifting I was able to reap the benefits and add 25 pounds of muscle! After that it became pleasurable and I was no longer called chicken legs. I lifted about four times a week, ride permitting. My mom would always drive me to the gym, which at the time was a YMCA. I kept stuffing my face, and magically the pounds started multiplying! Every week my strength was going up, I couldn't believe how easy it felt to me. From the get go, all I used were multivitamins and fish oil. Later, I introduced a pre-workout supplement. I keep it simple to this day. Supplements are exactly what they are, SUPPLEMENTS. They are meant to be a part of, but not replace, a solid diet and training regimen. A quality protein powder was always a staple from the beginning. I prefer Optimum Nutrition 100% Whey. When I started, my diet was very poor. I got away with protein powder, milk, peanut butter sandwiches and trail mix bars. And yes, I gained weight! But I soon realized after my initial gains that my metabolism was catching up. The sooner you realize the better. Here is my current diet and with what I've seen the most gains. Note: The meals could be in any order depending on when I lifted. The olive oil brings a lot of controversy to my diet. Many people say "oh that's unhealthy" when in fact mono and poly unsaturated fats are healthy; I just chase it down with some juice or water. It allows me to get in the calories that I require to gain weight. It's much easier to drink 1000 calories, than it is to eat 1000 calories. Usually my workouts with a partner would take about an hour and a half to an hour and forty-five minutes. Every lift I did was a drop set. Eating was my biggest enemy. How am I going to pack all this food for the day? It was always a struggle. Eventually, the body gets used to more food and it makes it easier to eat more over time. I plan on competing in April 2013. From there, I plan on competing in the 2013 teen nationals lightweight or middleweight division. No one person is the same. What works for me may not work for you. Find what works for YOU. A perfect example is my olive oil theory. But hey, to me, it works. I've gone through many different training methods and diets. They all had their benefits, but I've found what works for ME. Keep on striving toward your goals and don't be afraid to switch it up! Initially, my goal was to shed the pre-conceived notion of me being scrawny with chicken legs, and so far I'm doing great. I've gained a total of 50-plus pounds and I'm showing no signs of stopping!